Patricia Ann Ziebell passed into Glory on Sunday March 4th 2018. She was preceded in death by her high school sweetheart and husband Ron Ziebell and her parents, Charles and Eileen Wright. She is survived by her sister, Charlene Evans, children, Ronnie, Jeff (Jeanne), and Marti Brolliar, 7 grandchildren, and 6 great grandchildren. Pat was born in Alton, Illinois in 1941. Her family moved to Arizona during her elementary school years. She went on to graduate from Phoenix Union High School in 1959, the same year she married Ron. She was still close to her high school friends and attended many class reunions with them. Pat loved many things. First and foremost Pat loved Jesus Christ as her personal Savior and Lord. She served Him whole heartedly throughout her life by serving in many ministries at the churches she attended. Next to the Lord, Pat’s family was most important to her. She loved attending any of the kids, grandkids, great grandkids, nieces and nephews’ activities. She loved family gatherings. Whether it was at her house or elsewhere she loved to be with her family. She also loved being with friends, whether it was going to dinner, attending weekly bible studies, or even traveling with them. Pat loved to knit, sew, and quilt. It seemed like she was always making something for someone. To sum up her life in a single phrase would be, “A life of service to others”. Thank you, Pat, for your Godly example. You will be truly missed. We can’t wait to see you again one day. We Love you!! A Funeral Service will be held at 10:00 AM, Tuesday, March 13th at Church of the Master 6659 E. University Dr. in Mesa, 85205. In lieu of flowers, donations can be made in Pat’s name to either Church of the Master Deacons fund or Grace Covenant Church Building Fund. Pat and Ron were school mates and wonderful friends to my husband Gene and I in the early 60s. Since my husband passed in 2006 I have had no contact with Patti at all, but found out from class mates of her passing. My heartfelt condolences to her family and friends. I remember some good times, especially class reunions. Also, @50 years ago, when she worked for McCullough’s (Fountain Hills, London Bridge) she asked me to do a few translations for her clients in Germany and Switzerland – it was a great relationship. But after Ron passed, we saw little of each other. It is wonderful to hear that she was close to the Lord, her family and her friends. She will always be in my memories as the cheerleader, the peppy go-getter, the positive, smiley and supportive friend. Until we meet again, rest in peace in the arms of the Lord. Pat will be missed by so many. I met her at a Bible Study at my church. I met her at monthly luncheons. I will always remember her smile and laugh. She always brightened my day. Thank you Auntie Pat for being so kind and special. I married into the family 15 years ago and she welcomed me with open arms. Her spirit and smile is one that I shall remember for a lifetime. Erica, Krystal and I will not be able to travel to the services but Greg and our spirit will be present. We love you all and will miss her birthday messages that she would would always send. So honored to have known both of them. May they rest in peace. So honored to have known of them. May they rest in peace. So honored to have known them. May they rest in peace. My Condolences to all of little Pat’s family. She wore her heart on her sleeve..a beautiful person inside and out. May she rest in peace with with her high school sweetheart and husband Ron. I have known Patti since high school and she always had a smile for everyone. We met at Emerson Elementary School 66 years ago. Our friendship was a treasure, and you will be missed and loved forever. I know you are happy in Heaven with Ron, and your parents. Until we meet again. Pat was very Christ like in everything she did. She served her family and her friends. I don’t know if she ever missed a day of scripture study. Ross and I felt so honored to have her part of our family we loved her dearly. She wasn’t just a personal secretary but a confidant a mother and fiercely loyal. I admired most her love for our Savior. She was a great friend and helper. We will miss her smiling face and helpful demeanor. she was one of a kind friend. We are so sorry for your loss. May God comfort you and grant you the grace at this sad time. Our prayers are with all the family. Pat was a wonderful person, always happy and loved life. Beautifully obit written with love, respect and devotion by Pat’s granddaughter, Alysha. Thank you for sharing with all of us. I will miss this fine Woman of God’s testimony as she through her daily life serving God. Thank You Alysha. 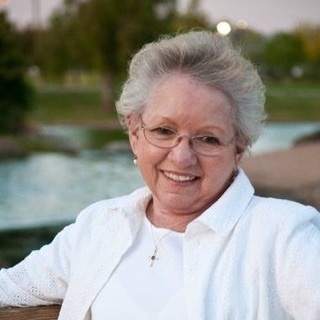 I will miss Pat’s sharing her love of God with everyone. Our deepest sympathy for your families.